In part 2 of the Writer's Notebook and Bullet Journals series, I introduced you to the basics of Bullet Journaling. Now I’m going to show you how to take your BuJo to the next level, and you can even make it an all-in-one planner/journal/writing notebook of your dreams if you’re so inclined. 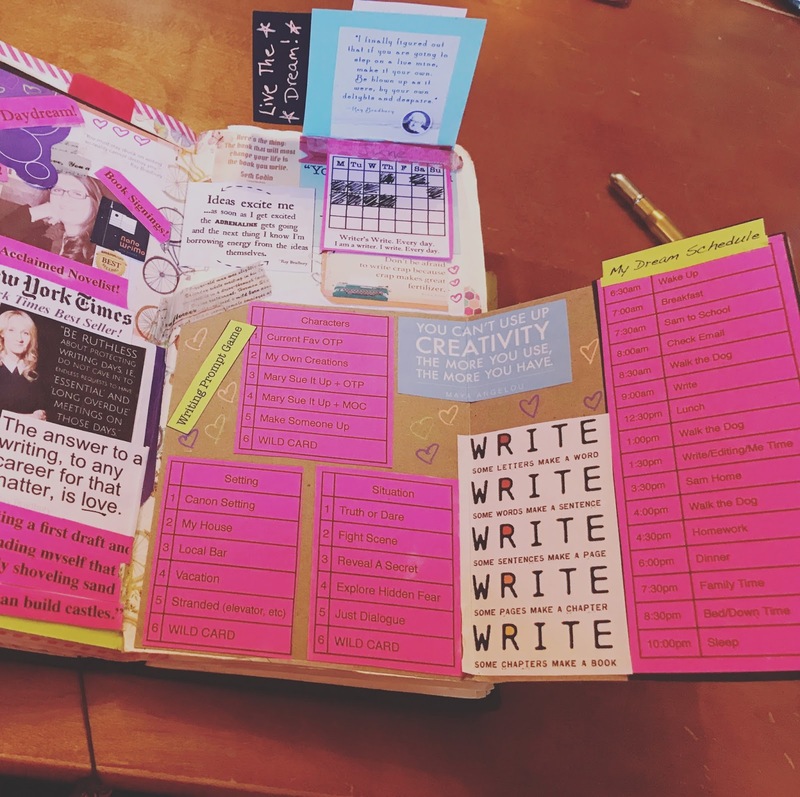 Before I show you how to use Bullet Journaling for writing, I’ll give you a quick rundown of BuJo terms and methods, and they are typically used for. I mentioned leaving a few pages blank after the Index. Many journalers use that space to make year-at-glance lists and calendars. I tried that, but I always forgot to look back at it when I was planning my weeks and months. So I ditched it. And that’s the thing to remember, always, and is my favorite awesome feature of Bullet Journals. If something isn’t working you can just stop doing it and try something else without having to start from scratch each time! In its place I reserved that space for long-term shopping lists/things I’m saving up for and things I need to remember but aren't terribly urgent. For writing, you can use that space to list projects you’re currently working on, publishers you’re researching, etc. Or you can skip that all together. 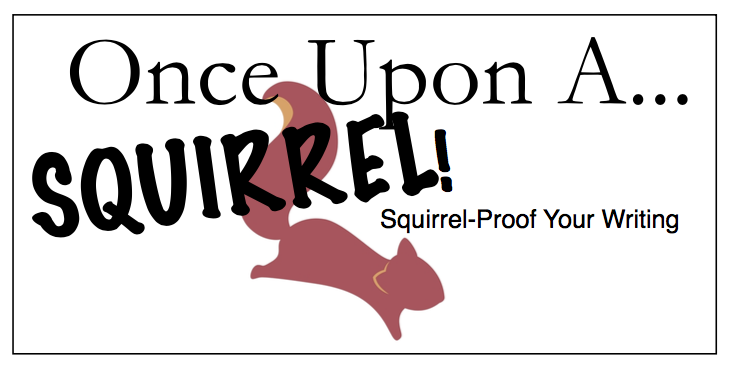 Another place to put a collection of ideas like I just mentioned is the….drumroll…. You might have heard of Collections, and for the longest time I couldn’t quite figure them out. I came to the realization that they were mostly just for funsies - like a list of the books you’ve read, the movies you want to watch someday, or a collection of inspirational quotes. Many of the examples online are illustrated with awe-inspiring doodles and stencil creations and to be honest that’s kind of what threw me off. I can’t even draw a straight line (even with a stencil!) so it didn’t seem like anything I should even attempt but I gave it a try, and it turns out they’re actually pretty useful. Spark Sheets - This is where I write down all my ideas. When I get a flash of an idea in the shower or hear some awesome dialogue or come up with just a snippet of a plot idea it goes here. Again, it’s just a list so it’s as basic and messy as the rest of my BuJo, but it serves its purpose well. But you can also use collections to list themes you want to explore, keep character sketches, dialogue, settings, plot twists, etc. You can leave a few pages blank around each topic or just thread the pages between everything else. I usually start a list and just leave the rest of the page and the other side blank for a collection I start and then thread it through everything else. 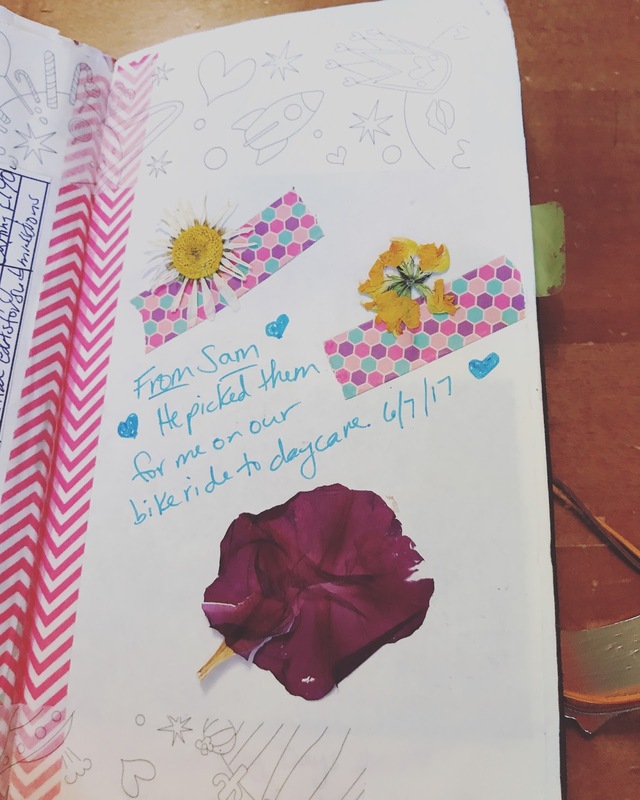 A very common feature of Bullet Journaling is the habit tracker. You can literally track anything from water intake to working out to stopping a bad habit. All you need is a grid usually with 31 lines for each day of the month. Though some do weekly habit trackers, some do yearly. You can make it any way you want. 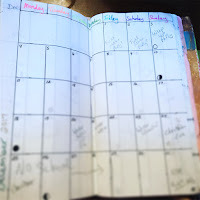 I use a variety of habit trackers to stay on task. 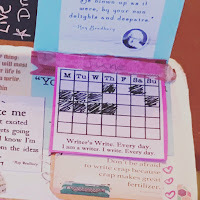 For writing, I use a couple of habit trackers for different reasons. I have the monthly habit tracker that I made specifically for my vision board (more on that later) that can be changed out every month because I’m a sucker for filling in boxes and seeing how long I can keep a streak going. The other habit tracker I adapted from Rachel Aaron's 2k to 10k: Writing Faster, Writing Better, and Writing More of What You Love to keep track of word count, where I write, and when. My hope is to see when and where I’m most productive so I can capitalize on that for maximum output. So far it’s pretty radon where I can find the time and place to write. I get most of my writing done on my phone as I’m waiting to run from one place to the next. And since I was able to see that pattern I invested in a pocket Bluetooth keyboard for my phone, so now I get even more writing done. Mock author bio because why not? 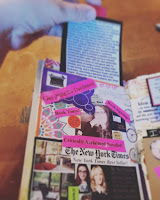 I’m also a sucker for a good vision board, and this actually is one of my Collections. I know they aren’t for everyone and that’s okay. 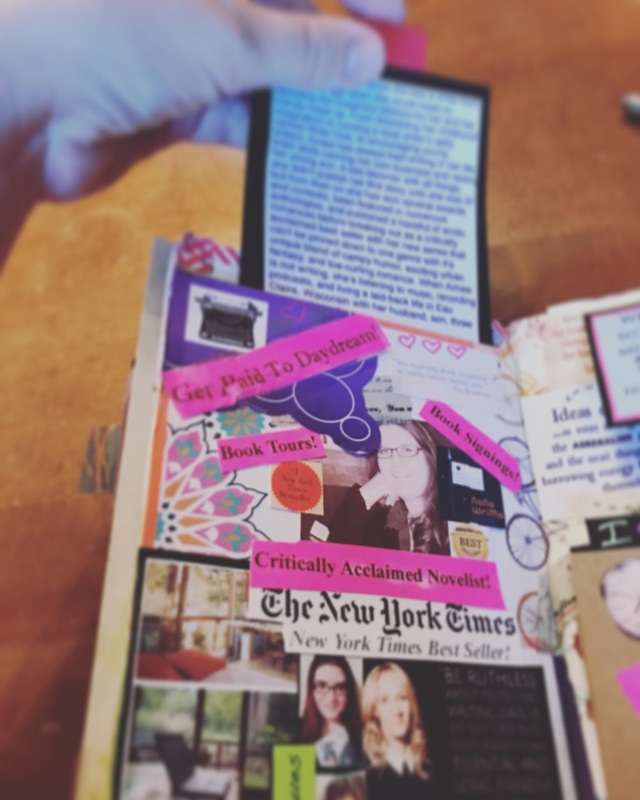 If you are like me, who likes vision boards but doesn’t really have a set writing place to set it up in, you can keep your vision board in your writer’s notebook. 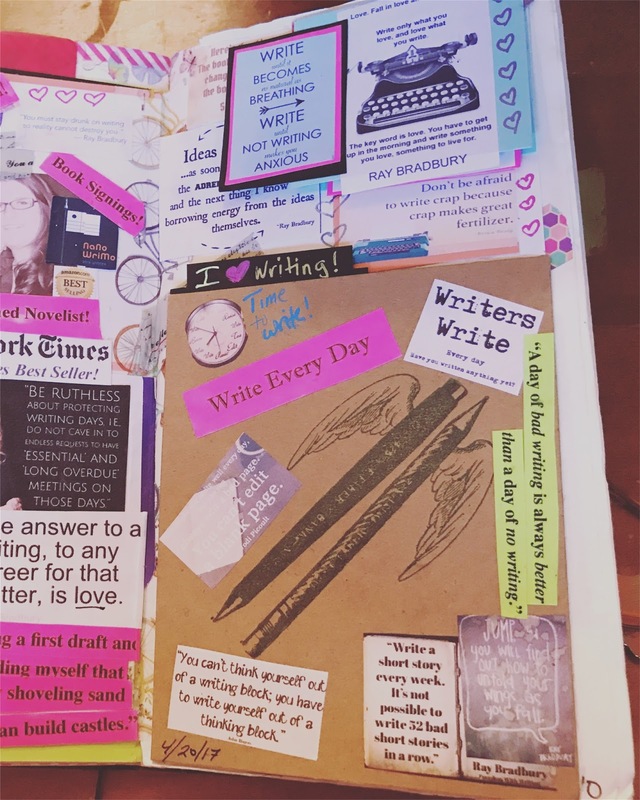 I used a method outlined in Lifelong Writing Habit by Chris Fox where you write out exactly what your day will be like when you meet your writing goals (i.e., when and where you write, are you still working a day job, how famous are you, etc.) I also added a book bio for my future fantasy writing self that touches on the things I hope to have written someday. And because right now my day is very at 2pm I have to be here and 4pm I have to be there, I made a mock hourly agenda of what my future schedule will look like. 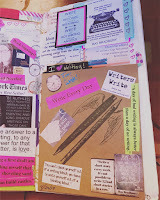 Then I went hog wild and added the changeable writing habit tracker and even a writing prompt game because ADHD. 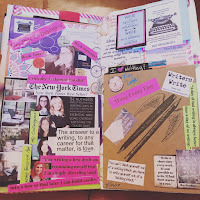 But since it’s fun and interactive so I’m forced to look at it on a fairly regular basis which if you’re into vision boards that’s sort of part of how they work so my going overboard tendencies paid off, for a change. I personally don’t use symbols. I’ve tried several times to implement them, but they just never catch on for me like other aspects of bullet journaling. Which is funny because symbols are sort of the whole point of Bullet Journaling. You're supposed to write bullet style lists of happenings and thoughts and such and then use a symbol to classify each thing for easy reference. That’s why I really wanted to like symbols. I had fantasies of placing symbols next to certain character profiles, and for tagging dialogue or scenes to those characters. I had every intention of using symbols to differentiate between random plot bunnies and actual plotting for my current work in progress. But alas my handwriting is too messy and all over the place for me to track what symbols go where. And I kept forgetting which symbol stood for what even with a key (which I kept loosing, of course) or I would forget to use them altogether for long stretches at a time. If you like the idea and can utilize them better than I can, please feel free to take my idea of using them for writing/plotting. I’m proud of the system, I just can’t use it. Yet. I’m still going to keep trying. But for now, I just make sure to index everything very very specifically and very diligently. 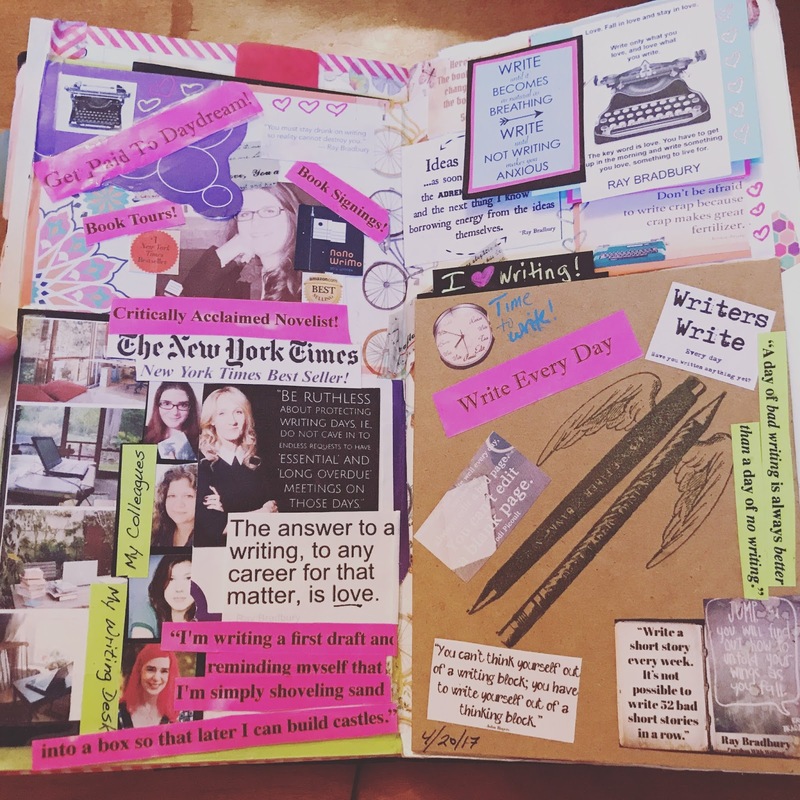 There are a ton of amazing looking day planning layouts you can check out (but don’t, it will make you cry, seriously) but this is what mine looks like. It’s not pretty, but it’s simple, functional, and tailored specifically to what I need. It went through many evolutions before it became that. I tried to do what a lot of people tends towards which is to make their weekly layouts at the beginning of each week, but I can’t roll like that. I need to keep track of things that get scheduled months in advance, and I can’t rely on trying to remember to flip around my book to remember what it was I supposed to do. Not to mention I need to know whether I have the free time to commit to things. So I just sat down and made a whole year's worth of a planner. It took me about two or three days, but it was totally worth it! As you can see, you can customize your planner anyway you want. I just used a ruler, water drop stencils, some pretty gel pens and I was ready to go. No need to go all out with crazy stencils and intricate daily layouts unless you want to. It can be as sloppy and basic as it needs to be. That’s why I love bullet journaling, it’s everything I need all in one place that changes with me. 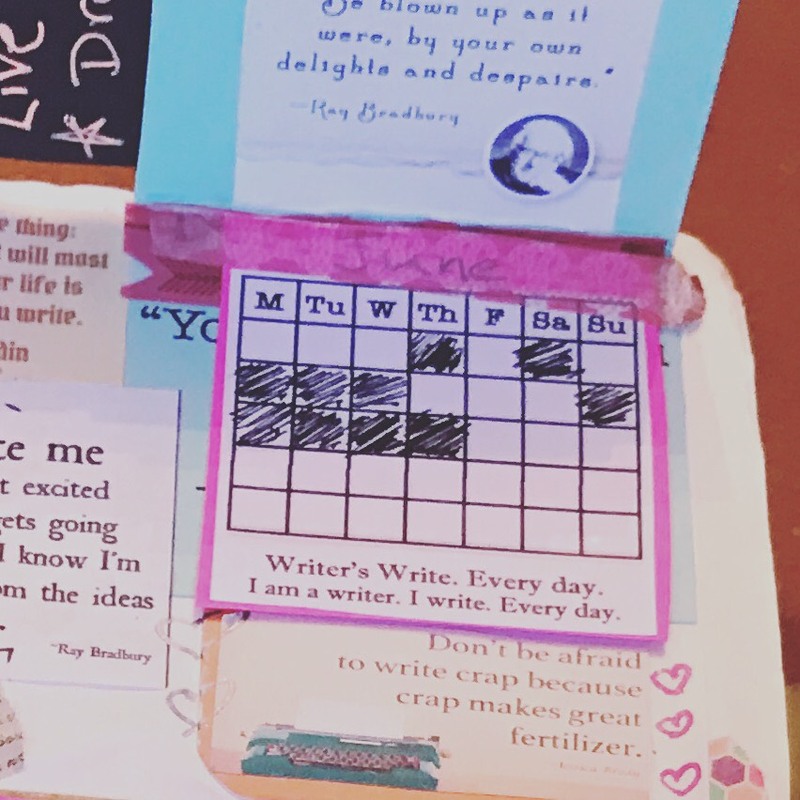 If you don’t need a day planner with your writer’s notebook, you could always use a weekly layout for keeping track of writing assignments, setting up intentions for what you are working on that week, and if there are any publishing deadlines, you need to keep in mind. 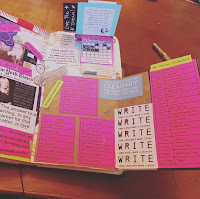 Or go further and create monthly/yearly/whatever planner to keep track of your writing goals and deadlines. I like to write out a week or two in advance roughly what I will be working on. I usually give myself “choices” for each writing session to keep my ADHD brain from getting bored while still maintaining a controlled direction, so I don’t wander off course. Since I use my writer’s notebook as my all-purpose day planner/journal, I combine the two in one calendar. I have a numbered list of blog topics, writing prompts, and story ideas planned out for a month or two in advance with dates so when I plan my week I can check to see that I’m on target and just put a number in my writing section of my calendar for extra quick reference. 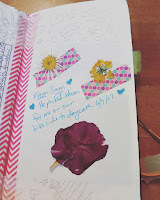 The rest of my journal is free reign for me to write whatever. Sometimes I even use it for drafting and writing, but mostly I use it as a place to brain drain all my ideas in order to clear my head for my current writing project. By having a safe place to keep all my thoughts, ideas, obligations, etc. I can dedicate more mental energy to the creative process. And since it’s all in one book I don’t have to take a ton of things with me and risk accidentally leaving behind one or the other (usually the writer’s notebook would get left behind). This way I can always keep my journal handy for when an idea strikes or I need to remember to do something later. Hopefully you found this introduction into Bullet Journaling helpful. I can’t sing it’s praises loud enough because it has allowed me to be more organized and stay on target. There are even more elements that you can add on that I didn’t even get to - daily logs and migrations (part of the symbol system), plus ton of awesome BuJo “hacks” to help you be more efficient. My favorite is 10 Bullet Journal Hacks & Ideas video with pretty straight forward tips and tricks. Let me know how Bullet Journaling works for you if you've given it a try or you're trying it for the first time. I'm always on the look-out for new ideas so share those if too, please.